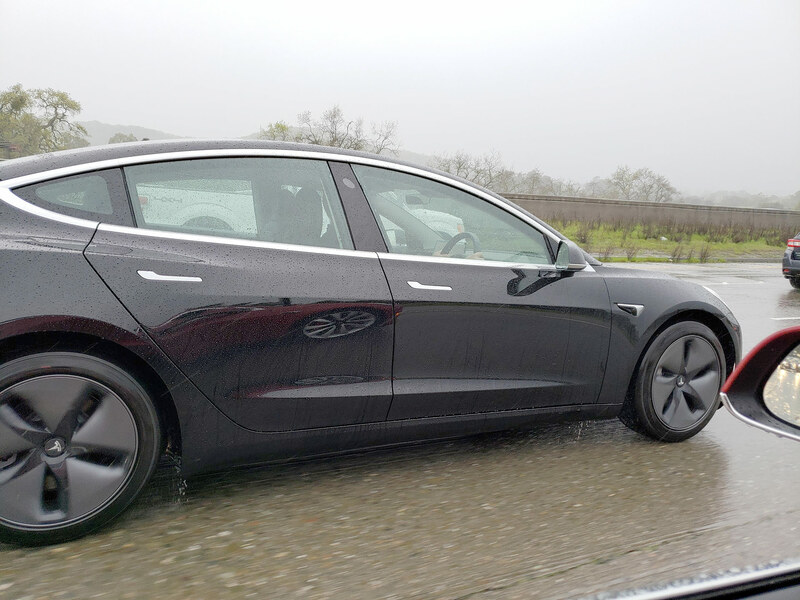 First-ever Right-Hand-Drive Tesla Model 3 has now been spotted on the interstate-280 California highway (HD photo below) — I-280 has been notorious for Model 3 spottings in the past as this freeway is near to the Tesla HQ in Palo Alto, hardly 3-4 mins drive. Tesla Model 3 reservation holders from the Right-Hand-Drive markets especially the United Kingdom has been very patiently waiting for their turn to grab the best and safest car in the world. Elon Musk stated that Tesla Model 3 is designed in a way that requires min engineering and tooling changes for developing the RHD model, in a tweet last year he said that the RHD Model 3 deliveries will probably start mid-2019, with the latest Model 3 RHD spotting, the timeline seems to be on track. Tesla brought the first display Model 3 to the United Kingdom at the end of last year after the jam-packed tour of the European stores, although this was a Left-Hand-Drive United States version of the car, it gave the reservation holders a chance to experience the vehicle first-hand. EV Maps, a British electric vehicle routing website talked to the Tesla staff in the United Kingdom last month and was able to know that the Tesla Design Studio / Model 3 Configurator will be open to the RHD markets next month or so. The spotted Right-Hand-Drive Tesla Model 3 is in the basic black color with aero wheels and according to the Tesla Subreddit user who snapped this rarity Mister_Salty_Peanuts, this specific RHD Model 3 (pictured below) had a ‘Dual-Motor‘ badge on the rear — unfortunately he was able to take only one photo. As Tesla tradition, the higher-end variants will be introduced to the RHD markets i.e. mainly the United Kingdom and Australia, Tesla has already discontinued the Mid-Range battery option after the introduction of the Standard Range and Standard Range Plus Model 3. First Right-Hand-Drive Tesla Model 3 spotted - Dual Motor, Aero Wheels, Black Color. Click/Tap for HD Version.